Black History Month, celebrated annually in February, was born out of the need to give recognition to the many contributions African descendants have accomplished throughout the world. From little known facts such as inoculation being introduced to America by a slave to the induction of the first black President, the history of African American people is extensive and significant. The New Mexico Black History Month Organizing Committee (NMBHOC) is proud to continue the tradition by coordinating a variety of cultural events throughout February. Kicking off the celebration is Roots Revival Revisited: a musical journey into the lively, beating heart of black history (February 2-4). Get tickets here! Another integral event during Black History Month is the Asante Awards, at which the NMBHOC celebrates a person in our community whose work and ethics edify our community. This year&apos;s 3rd annual ceremony will recognize the achievements of black journalists in New Mexico. The recipient, Ron Wallace, will be receiving the award for his outstanding work with the Perspective publication that has been a staple in the Albuquerque community. This FREE event at the Special Collections Library will be held on February 7 at 6pm, with light refreshments and entertainment provided. Celebrate with us in an evening of dining, dancing and honoring true education pioneers. The annual Cotton Club Scholarship Gala will this year celebrate the legacy of Albuquerque&apos;s education champions. Honorees include Dr. Lenton Malry, who was the first African American to receive a doctorate in Education from UNM, was Albuquerque&apos;s first African American school principal in 1964, the first African American to serve on the State Legislature in 1968 and Bernalillo County&apos;s first African American commissioner in 1980. Mrs. Joy Malry will also be honored, as a lifelong educator who is known for her major influence on bringing kindergarten to New Mexico and a major catalyst for the state to receive funding for early childhood education programs. Get Gala tickets here! The month long festival will end with our wildly popular Gospel Best Competition. This competition allows the public to see the many facets of musical praise that black churches are widely known for. You don&apos;t want to miss it! 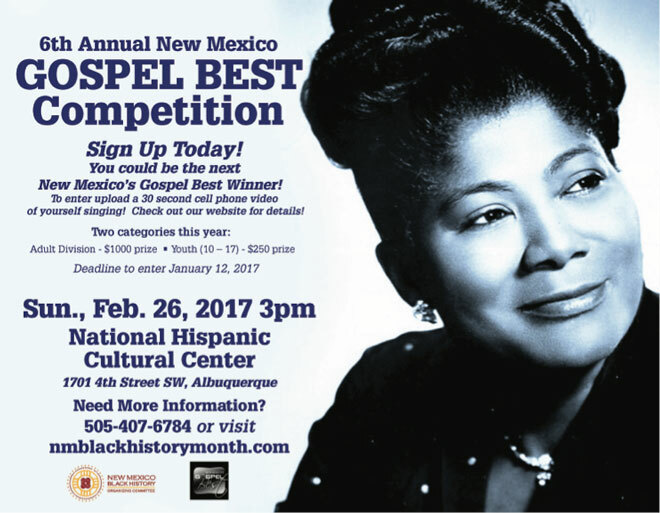 Be sure to take time this year and experience Black History Month in New Mexico at one of our events. Take a look at the fun from past years in our blog archive. For a list of all Black History Month events, visit NMBlackHistoryMonth.com. Leona Davis-Brown is the marketing manager for the New Mexico Black History Organizing Committee. Outside of outreach and coordinating Black History events for the committee, she is the social media specialist for the City of Albuquerque's Cultural Services Department. To stay up-to-date on all Black History Festival events visit the February Festival tab on NMBlackHistoryMonth.com.